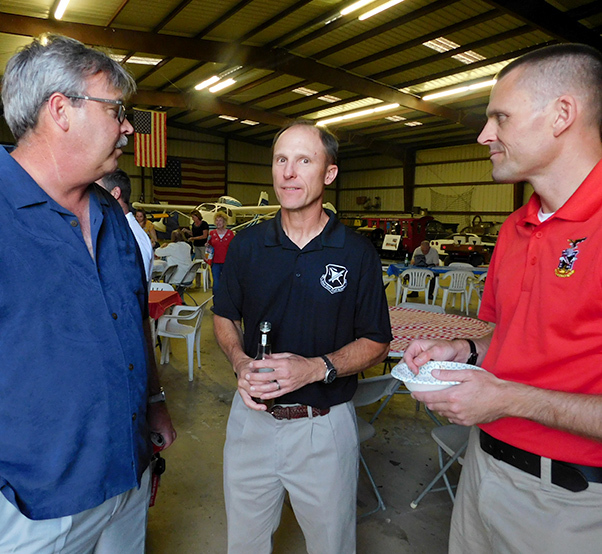 Dr. Allen (Al) Peterson, president and CEO of the National Test Pilot School, chats with veteran pilots Dave Vanhoy and Alan Juspersen during the Hansen Hangar BBQ. When asked what the NTPS is best known for Peterson said the school’s one-year professional course takes students from pilots to test pilots. 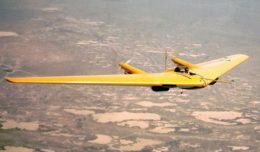 What started as a friendly gesture more than 20 years ago has become a family tradition for the Hansen family as, Antelope Valley, Calif., residents Al and Cathy Hansen celebrate with the men and women who graduate from local test pilot schools. 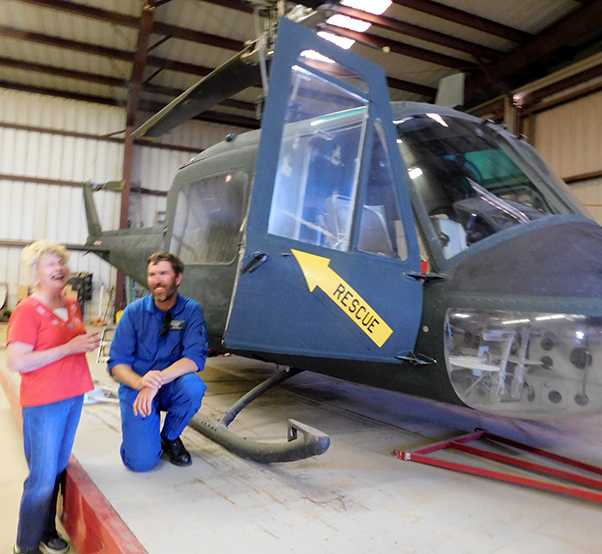 The Hansens own a hangar at the Mojave Air and Space Port which gives the patriotic couple the room needed to open their doors and pay tribute to the graduates for all their hard work and effort. “We held our first barbecue in 1997 when I ran into some Navy pilots in the pilot’s lounge at the Mojave Airport,” Cathy Hansen recalls. Hansen said she jokingly asked what the Navy was doing in Air Force land and was told they were doing their qualification flights in civilian aircraft here because the Camarillo airfield was fogged in. Hansen’s heart went out to the Navy pilots and she invited them all to dinner at her hangar. She told them she’ll buy the steak if they bring the beer. They accepted! Jim Brown III, vice president/chief operations officer talks about the MiG 21 and MiG 23 Russian military fighters to a captive audience. Brown pointed out the many differences between the two Russian-built jets and American fighters. He said in order to teach pilots to fly the MiGs they had to rewrite the flight manuals because the Russian style of writing the technical orders is not as explicit as Americans are used to. “I called Burt and Tonya Rutan and some of the local pilots and invited them to join us and meet some Navy test pilots. They did and we all had a blast!” Hansen reminisced. Hansen said a few days later she began receiving inquiries about when the next test pilot dinner was going to take place and says that’s how the tradition began. 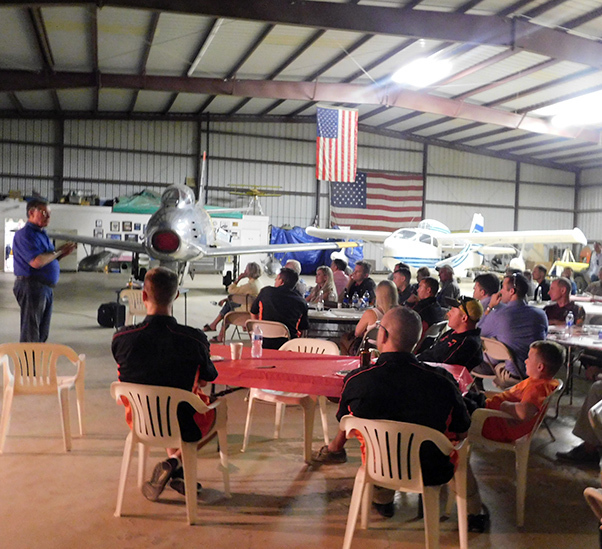 The Hansens now hold a graduation dinner for test pilot students every September and March. “I can’t say no to anyone that’s in the military,” she says. 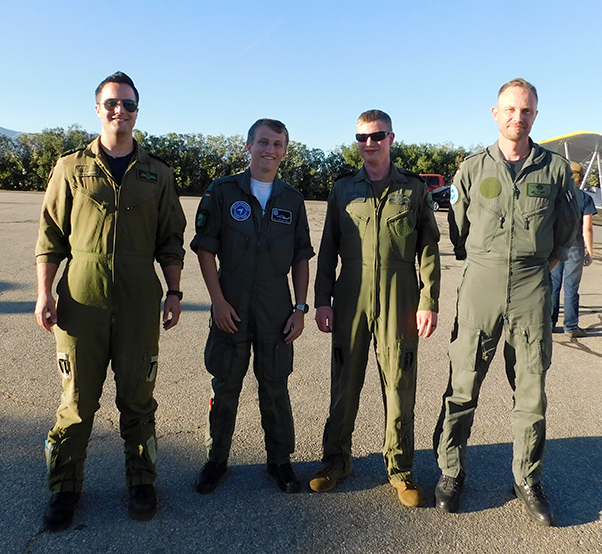 From left: National Test Pilot School students Corey Gonder of the Royal Canadian Air Force; Jan Vincent Kleu, German Armed Forces; Kyle Standley, also of the Royal Canadian Air Force; and Jens Meyer enjoy an evening of wonderful food, plenty of drink and meeting fellow test pilot students. The event was held at the Mojave Air and Spaceport in Mojave, Calif., and was hosted by Al and Cathy Hansen. The Sept. 18 event included guest speaker Jim Brown III, vice president/chief operations officer for the National Test Pilot School. Brown has flight tested the MiG-21 and MiG-23 Soviet fighters and shared what he’s learned and about the differences between the Russian military jets and American fighters. Hansen says her reward for holding the dinners for the graduating test pilot students is the joy of meeting so many young men and women from all around the world. 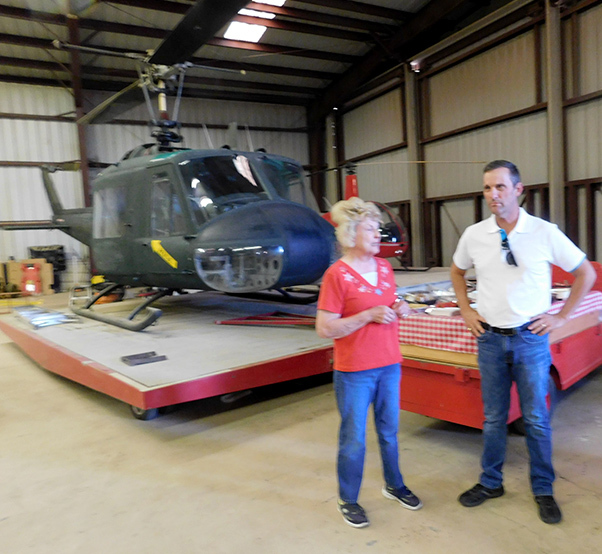 Nigel Speedy, a helicopter instructor at the NTPS in Mojave, Calif., chats with Cathy Hansen at the Hansen Hangar BBQ Tuesday evening. Congressman Steve Knight chats with hostess Cathy Hansen before joining test pilot school graduates during a barbecue dinner honoring the many test pilot school graduates. The congressman listened to their stories and shared a few of his own stories about life with his father William J. “Pete” Knight who holds the world’s speed record for flight in a winged powered aircraft.